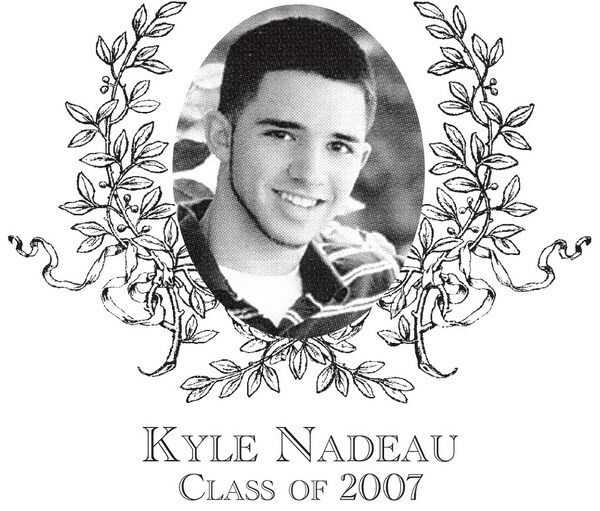 Kyle Nadeau, Class of 2007, was a three-sport varsity student-athlete in Football, Basketball and Baseball. Kyle received 14 Varsity letters and was captain in all three sports his senior year and was also captain of the basketball team in his junior year. He achieved all of this while maintaining a high-honor status during his time at Bartlett. On the gridiron, Kyle started all four years and achieved great success while playing quarterback and safety for the Green and White. He made a total of 8 touchdown passes in 4 Turkey Day games against rival Southbridge. He was awarded two Rudy Sabatinelli Awards in 2005 & 2006 and also received the MVP in the Bartlett/Shepherd Hill game in 2005. In basketball, Kyle has the distinction of being the Indians� second leading scorer. The point guard scored 1,440 points during his career at Bartlett and led the Green and White to the Clark Tournament Championship in 2006 and a District Championship in 2007. Kyle holds the record for the most three-pointers scored in a Clark Tournament by hitting 8 field goals in one game. He also holds the BHS record for scoring the most points (36) in one Clark Tournament game. The Indians achieved a record of 32 � 6 in Kyle�s junior and senior years and went 5 � 1 in the Clark Tournaments in those years. As a baseball player, Kyle led his team to two district championships (2006 & 2007) and had an impeccable batting average with his highest of .490 in his senior year. He played shortstop and defensively had less than 3 errors in his junior and senior years. He was a five year starter in baseball. The 2007 Bartlett graduate received many accolades for his achievements. He was a two-time Worcester Telegram & Gazette Super Team selection in basketball and a T & G All-Star in baseball and football. He also was a consistent SWCL All-Star in basketball and baseball. Kyle attended WPI from 2007 to 2011 where he played basketball and started all four years. While playing for WPI, he played on the 2010 NEWMAC Conference All-Star team. WPI was ranked in the top 25 in Division III in the nation for all 4 years. Kyle joins his father Gerry as a member of the BHS Athletic Hall of Fame. Kyle lives in Worcester and works for NTS Direct. He is the proud father of his two-year old son Nolan.